Introducing MOVITRAC® LTP-B, the all-rounder for specialist field applications. Dusty and damp ambient conditions are no problem for our frequency inverter with high degree of protection. Connect, power up, and you’re off! Do you need a frequency inverter for your drive solutions that can be installed outside the control cabinet? One that is also easy to operate and can handle open-loop speed control of synchronous and asynchronous motors in power ranges up to 160 kW, even without an encoder? Then you should check out the functionality of our all-rounder in the field: the MOVITRAC® LTP-B in IP55/NEMA 12k. It also offers a guaranteed overload capacity of 175%. Thanks to the STO (Safe Torque Off) safety function and the integrated EMC filter, you can design your application to be not only compact and safe, but economic and efficient, too. Save time during startup and service with the clearly legible full text display. The large MOVITRAC® LTP-B frequency inverter family is also available in degree of protection IP20 up to a power rating of 15 kW for control cabinet installation. with 6 sizes from 0.75 kW to 160 kW. with the integrated keypad with full text display. as various designs are available for the common supply systems: 1-phase / 220 V to 3-phase / 600 V.
EMC filter fitted as standard in the 230 V and 400 V units. thanks to modern control modes for asynchronous and synchronous motors, without encoder or with HTL/TTL encoder. We have stored a table for you here. Process adaption The process can be adjusted to the actual demand through stepless speed and torque control (like with the IP20 device). 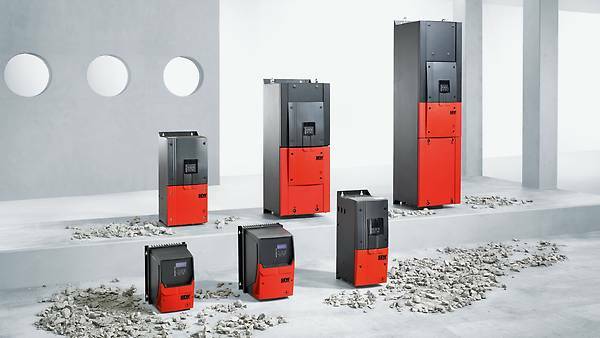 Besides the products from the energy efficiency system, our effiDRIVE® energy-saving solutions also provide expert energy advice and a modular and customizable service. Find out more! The MOVITRAC® LTP-B standard inverters in IP55 come with the “Safe Torque Off” (STO) safety function in accordance with EN ISO 13849-1 PL d and EN 61508 (1-7) SIL 2.
safetyDRIVE is our contribution to the safety of your machinery and systems. We offer not only functionally safe drive technology, but also various safety services. safetyDRIVE not only helps you to prevent accidents, but also reduces costs in safety zones and increases productivity. You can find out more about safetyDRIVE and the EC Machinery Directive 2006/42/EC here. Applications in dirty or damp environments, e.g. Please enter your postal code to find the corresponding contact person. Your entry [# search #] did not match any results. Please check your entry.